"Land of the Little People" is the 3rd Mandrake Sunday story. The story was written by Lee Falk and drawn by Phil Davis. 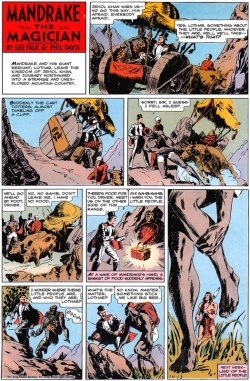 Mandrake and Lothar travel into a strange and unexplored mountain country. They soon befriended Prince Dano of the little people and his sweetheart Derina. Dano, prince of the little people. Brekky, pet frog of Taro. Bolo, man of the little people. Og, King of the wooly men. Cannibals and hereditare enemies of the little people. A mountain country northward the kingdom of Jehol Khan. City of the little people. Village of the wooly men. The title for the story taken from the strip of October 13th, 1935 (Next week: Land of the Little People). This page was last edited on 20 July 2018, at 10:49.